With St. Patrick’s Day 2013 nearly upon us, we’re featuring the second of two cocktails that claim some sort of association with the Emerald Isle and it’s descendents in the vast Irish diaspora. Last week, we had the delightful, but in no way particularly Irish, Shamrock Sour. The Conhattan was suggested to me by a representative of a newish brand of Irish whiskey which has divided critics to a certain extent and actually boasts a connection with the town of Livermore. Livermore is not, I must tell you, located near Dublin or in County Cork, but in County Alameda in Northern California, a relative stone’s throw from Oakland and San Francisco. Aside from being the home of the famous/notorious nuclear weapons laboratory, it’s also the home of Concannon Winery, which is legitimately Irish-American but also, well, a winery. This whiskey is made in Ireland, of course, by a distiller who finishes the whiskey in actual petite sirah barrels from Cali. As for the taste, it might not strike everyone as particularly Irish. While this video argues differently, to me, Concannon Irish Whiskey is probably best enjoyed by those who lean toward Scotch and find Jameson and Bushmills a bit overly soft. It’s very decent, but a bit astringent like a Scotch, not that there’s anything wrong with that. 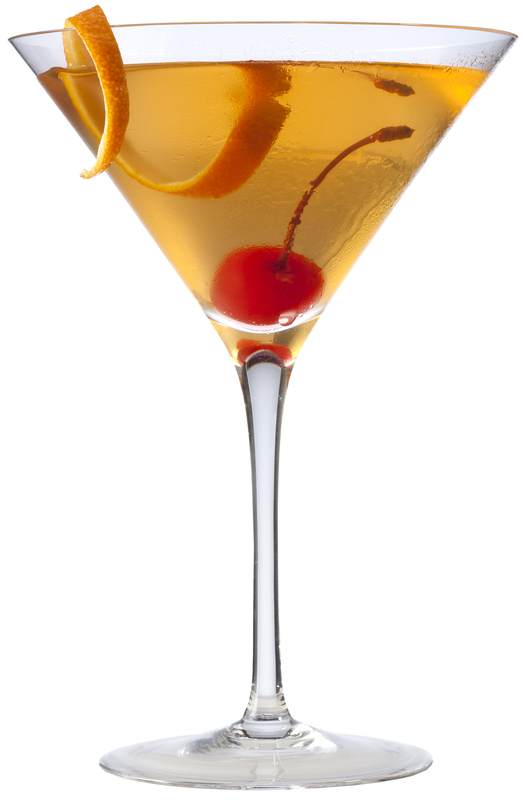 In fact, I think the astringency may just be essential to today’s drink, a very sweet variation on a Manhattan but which differs a great deal from the more classic Irish Whiskey Manhattan, which we featured last year at this time. This time, this whiskey is mellowed not by sweet vermouth, but by a very popular cocktail ingredient we’ve never featured here before — St. Germain elderflower liqueur. Anyhow, let’s get started with a concoction created for Concannon by Dublin mixologist Gillian Boyle. Put all liquid ingredients into a mixing glass or cocktail shaker with plenty of ice. Ms. Boyle would have stir just until the drink is “evenly diluted” but I say stir as long as you like, or be a heretic like me and shake the thing. Strain into a chilled cocktail glass, add the orange peel and, if you like, the cherry, and toast your favorite Irish or Irish-American person, real or imagined. I often strip out most of the brand names from my recipes because I like to offer readers the freedom to try out drinks with their own brands and not feel tied to what I happen to be using. This time, however, I really think it’s best to mostly stick with the script as provided by Boyle. I haven’t actually had the opportunity to try the Conhattan with other products, but I strongly suspect this drink would completely fall apart if you attempted it with say, Bushmills or Jameson’s. Much as I adore those highly approachable whiskeys, I strongly suspect that they wouldn’t stand up to this much St. Germain, which is complex but also extremely sweet. Also, you’d have to change the name (“The Bushhattan”??). You could probably cheat by using another brand of dry vermouth than Noilly Pratt, but since it’s been a favorite go-to brand of mine for years now, I see no reason to diverge there. On the other hand, I am offering readers the option of raising or lowering the amount of St. Germain, for a very simple reason. Very frankly, though I am no stranger to the tooth that is sweet, I found the original recipe, which called for a full ounce of liqueur, overly sweet — good enough for DOTW but very far from a personal favorite.Reducing it to 1/2 ounce, however, produced an extremely nice cocktail on which I’m proud to place my personal stamp of approval. At that amount, the light touch of the elderflower is just sweet enough to properly soften the kick of the Concannon without muffling it outright. It’s all about balance. Indeed, there’s a place for sweetness on St. Patrick’s Day, as director John Ford — the ultimate Irish-American mythmaker — undoubtedly would have agreed. Say what you will about me, I am a man of peace. That is why I come to you, this St. Patrick’s Day eve, with a small suggestion. If you should, for some reason, find yourself at an actual Irish bar or pub tomorrow night, please resist the urge to order two drinks, which I will now name. Now, I actually very much like the beverage we in the States and in England call the Black and Tan, which combines Guinness stout with Bass or another pale ale. It’s sort of the cappuccino of beer. However, as Ben and Jerry found out a a few years back, the name is pretty much the equivalent of naming a Jewish deli sandwich a Marauding Cossack. You see, just as the Cossacks weren’t known for their kindness to Russian Jews, the English Black and Tan militia men were not known for their gentleness to Irish folks during the nation’s war of independence from the British, circa 1920-22. As for the drink known as an Irish Car Bomb, let’s just leave that one alone. Instead, may we suggest this really very nice little beverage named for the Emerald Isle. Yes, knowledgeable readers will notice a more than slight similarity with a far better known classic cocktail, but that will only make it easier to order if your barman is not familiar — and he likely won’t be. Combine whiskey, vermouth, and bitters in a cocktail shaker. Shake or stir, as is your preference, into a chilled martini/cocktail glass. Toast, preferably while listening to the Pogues, the Chieftains, the Dubliners, or Van Morrison. As I alluded to above, it’s also a pretty obscure drink. Indeed, every recipe I could find online seems to come pretty directly from, Esquire‘s David Wondrich who, I promise, won’t be mentioned next week for a change. It’s worth noting, however, that he points out the use of orange bitters is also potentially controversial, if you know a little Irish history. I do think, however, your bartender will charitably assume you mean orange fruit and not Orangemen when you request a Manhattan made with Irish whiskey and Regan‘s Orange Bitters. And now, some music to drink the Emerald by.